This candlestick was made for the Lady Chapel of St Margaret, Lee, which was reconstructed by the architect James Brooks in 1888. It was probably designed by Brooks, since it is typical of his church metalwork in its use of copper gilt and colourful inset stones. The manufacturer was Cox, Sons, Buckley & Co, a London firm in business under this name from 1880 until it went into receivership in 1893. 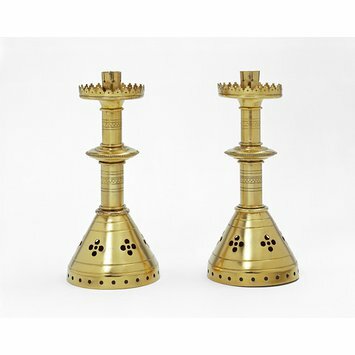 In the 19th century, ornaments placed on the altar, such as this candlestick, were the subject of dispute in the Anglican church. After the Reformation altars in Protestant churches had minimal adornment, but by the 1860s some authorities were recommending more ceremony and ritual. This required altar furnishings such as candlesticks, crosses, flowers and books as was common in Roman Catholic worship. Copper gilt and brass were cheaper than silver. They were popular in church furnishings from the 1860s to the 1880s, and designs by Brooks were particularly influential. His work was less ornate than those of other Gothic Revival architects such as A.W.N. Pugin or William Burges, and less concerned with reproducing authentically medieval detail. By the early 20th century, designs similar to those of James Brooks were offered by a number of firms including the Artificer’s Guild. Drip pan with crenelated, serrated edge and pierced decoration, the nozzle also pierced. Circular stem annulated with mouldings, chased fillets and a wavy pattern. Compressed knot encircled by beaded moulding. Stepped moulding above the shaped conical foot, annulated with shallow mouldings and pierced with quatrefoils and at the base with a band of small circular openings. Stamped on base " COX BUCKLEY LONDON"
In the Victorian period a dramatic and profound change took place in religious life. Centred on a renewed interest in the Middle Ages, it affected the appearance of churches and how services were conducted. The influential architect A.W.N. Pugin promoted the Gothic as the true Christian style. Although Pugin was Catholic, his theory appealed to Anglicans of the Oxford Movement - radicals who hoped to restore pre-Reformation services to the Church of England. The Cambridge Camden Society, founded in 1839, studied the past to identify the medieval architecture and furnishings that would be appropriate for the revived services. The society became an arbiter of style, offering an Anglicised version of the Gothic. 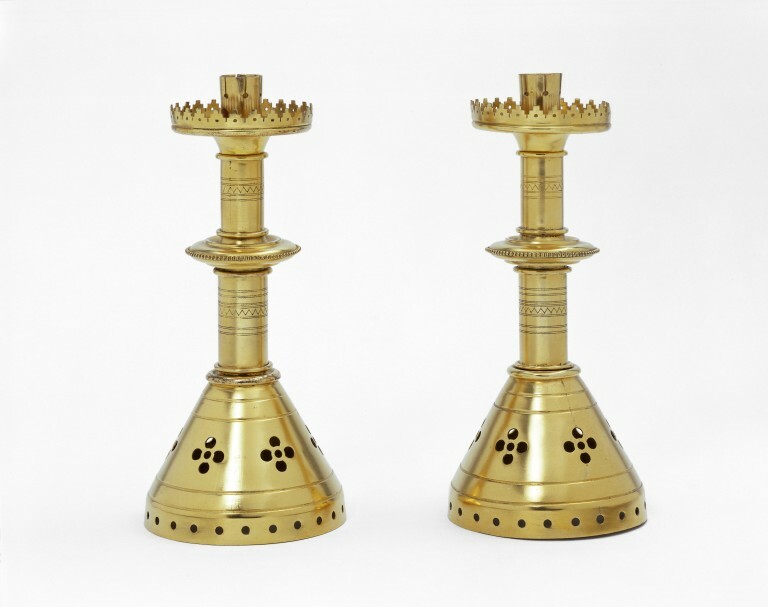 By the 1870s some of the equipment normally found in Catholic worship, such as the ciborium, was appearing in Anglican churches. It was not universally welcomed. Some observers found the incense, the altar cross and the emphasis on ritual scandalously 'Popish' or 'high church'. The Gothic revival in Europe owed more to nationalism than religious zeal. The completion of Cologne's medieval cathedral was an affirmation of German culture. In the Habsburg empire, Czechs and Hungarians similarly expressed national pride through Gothic architecture. Champions of the Gothic claimed by the 1850s that the style was triumphant in Europe. But classical architecture remained a serious rival, even in church building. Much of the most important Gothic work was in church restoration. In Germany and France, goldsmiths like Franz Xaver Hellner supplied Gothic church furnishings. Copper gilt and brass were cheaper than silver. They were popular in church furnishings from the 1860s to the 1880s, and designs by Brooks were particularly influential. His work was less ornate than those of other Gothic Revival architects such as A.W.N. Pugin or William Burges, and less concerned with reproducing authentically medieval detail. By the early 20th century, designs similar to those of James Brooks were offered by a number of firms including the Artificer's Guild.